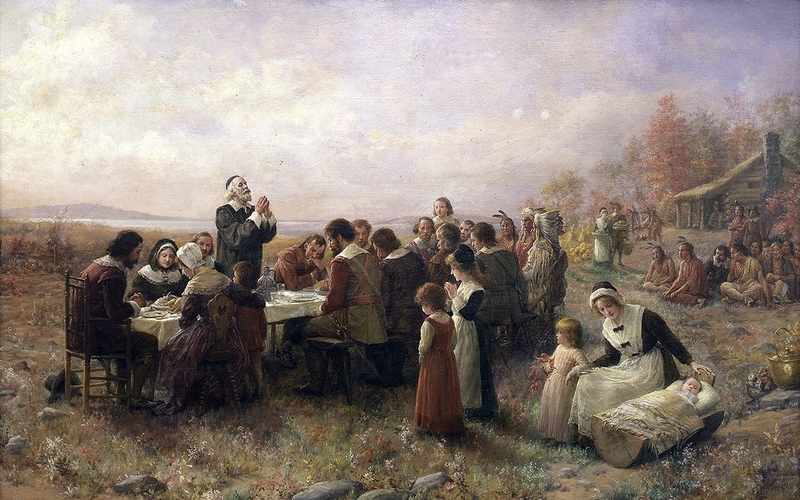 “THE FIRST THANKSGIVING AT PLYMOUTH.” BY JENNIE A. BROWNSCOMBE, 1914. A Google search for “family at Thanksgiving” yields disturbing results. There are, regrettably, many who will sit down to Thanksgiving dinner this evening who share the sentiments of Hartwell-Walker, Saltz and Holmes. They think Thanksgiving a secular holiday when family must be tolerated (no matter how disagreeable). But, in fact, Thanksgiving is a day set aside to acknowledge the beneficence of the Almighty, who created family. Indeed, upon creating Adam and Eve, the first husband and wife, the Bible tells us: “God blessed them and said to them, ‘Be fruitful and multiply.’” If God thought the family superfluous, He could have simply populated the earth with fully-grown human beings with no need for procreation. God’s answer was “Yes.” We are our brother’s keeper, our sister’s keep, our mother’s keeper, our father’s keeper, our Family’s keeper. That’s what Thanksgiving is about: Paying homage to our Creator. Honoring our parents. Showing loving-kindness to our relatives. And reconciling with family members with whom we have differences. 23 Nov	This entry was published on November 23, 2017 at 11:28 AM. It’s filed under Holidays and tagged 'FRIENDSGIVING', BIBLE, CURRENT EVENTS, DAVE HOLMES, DYSFUNCTIONAL FAMILY, ESQUIRE, FAIMLY CONFLICT, GAIL SATZ, MARIE HARTWELL-WALKER, PSYCH CENTRAL, THANKSGIVING, TODAY. Bookmark the permalink. Follow any comments here with the RSS feed for this post. Newer: Are Parents of Newborn Children Automatically Blessed? No. Thanksgiving is not a holy day. Is this another attempt to impose Christianity on pagan rituals? Is there to be no respite from Jesus?